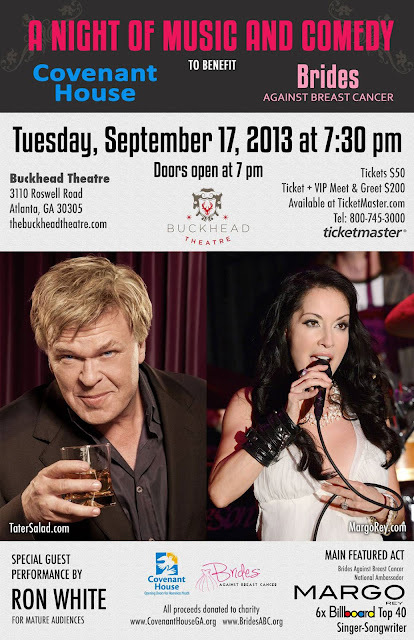 Thursday, September 17th The Buckhead Theatre will welcome Atlanta’s own, comedian Ron White. Ron is performing to benefit Atlanta-based charity, Covenant House. Joining Ron on behalf of the Brides Against Breast Cancer will be the organizations National Ambassador, comedian Margo Rey. Margo and her band will kick off the night with a performance featuring a special mystery guest. The Covenant House is the largest privately funded agency in America providing shelter, food, immediate crisis care and other service to homeless and wayside youths. Proceeds from the show will go towards aiding the charity in their initiatives to rehabilitate homeless children in the Atlanta area. A portion of proceeds will also go directly to Brides Against Breast Cancer. Doors open at 7pm and tickets are $50 reserved seating/$200 VIP meet & greet. The VIP tickets include: Premium Seats, Pre-Autographed VIP passes from Ron & Margo, A Photo with Ron & Margo, A Q&A session with Ron & Margo, A gift bag with a pre-autographed "A Little Unprofessional" DVD of Ron and Margo's "Habit" album. fun night out that will result in making a real difference in peoples’ lives! To enter you must comment and register your entry on our giveaway widget.